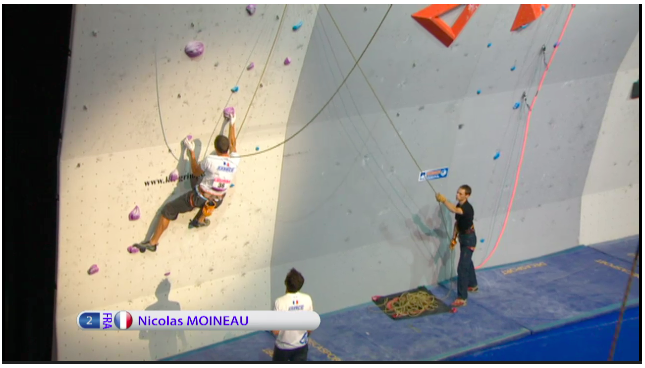 After the Men’s Bouldering final they moved right into the Paraclimbing B1 (Blind category 1) climbing final. 3 climbers and their helpers came out to preview the route. 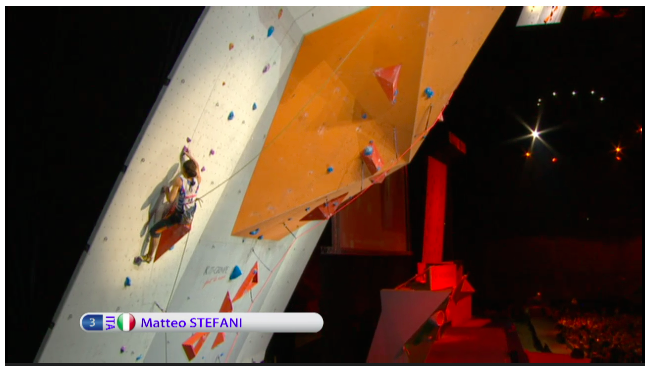 Since the climbers are all blind this means the helpers previewed the route and also told the climbers what the moves were, often manipulating their arms to give them an idea of the upcoming moves. You can see the two top ropes here. 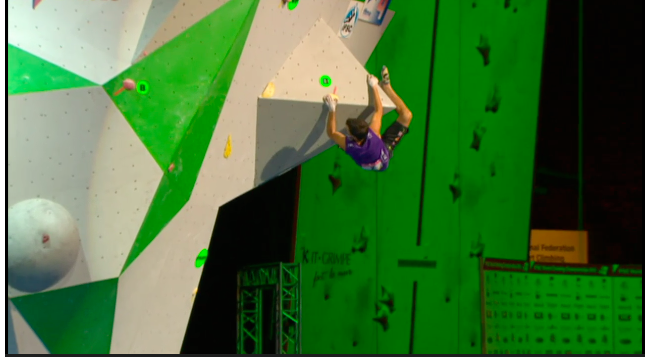 The climbers were tied in with 2 ropes, one toprope and a 2nd mini-toprope that was clipped in maybe 1/3 of the way up the wall. The wall was overhanging, and the idea of the mini-toprope was to keep the climbers off the ground if they fell early, sort of how gritstone climbers use multiple ropes sometimes. The route is on the leftmost wall. 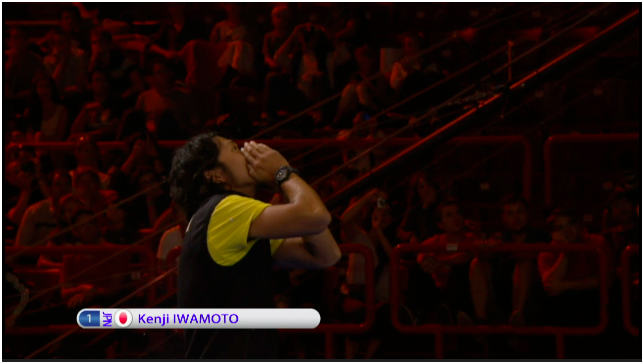 Kenji’s helper yelling to him. 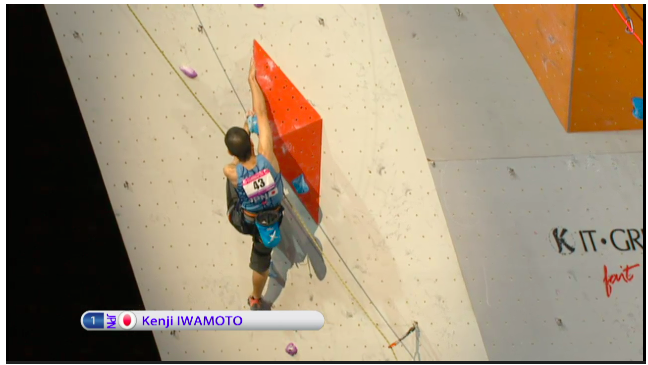 Kenji doing well. He fell right here after not figuring out to match and move left. He scored 14. 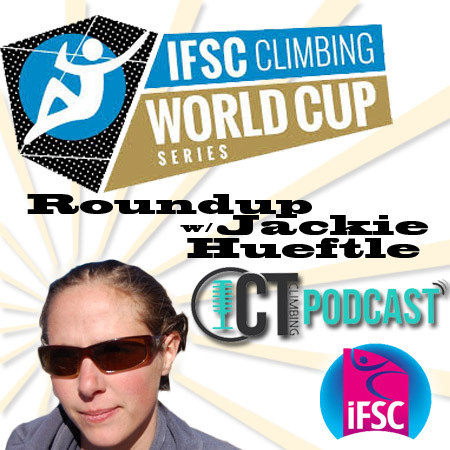 Blind climbing seems to take a ton of endurance, as you have to hold holds and body positions for as long as it takes to find the next hold. Not sure? Get a blindfold and try it yourself! It’s definitely safest on toprope though, so you don’t have to worry about landing. 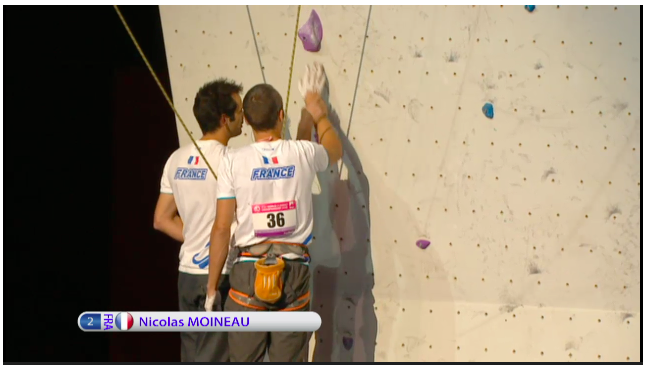 The French finalist Nicolas Moineau climbed 2nd. 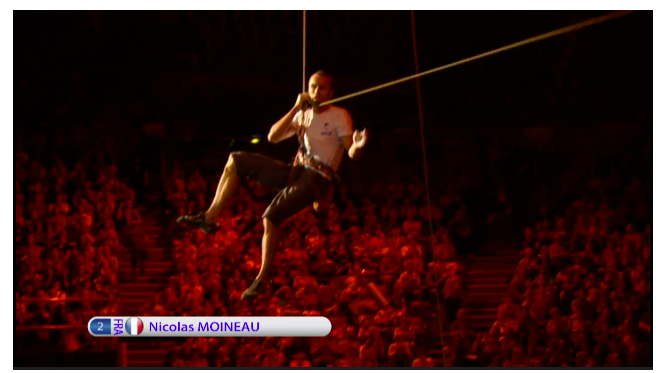 Nicolas sets off. 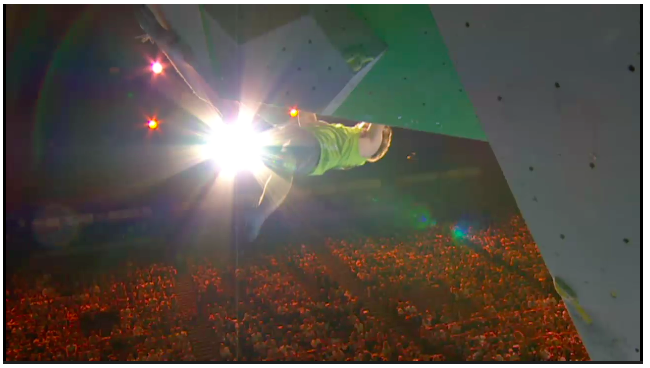 He went blind at age 3 and started climbing at 17 (I think the announcer said 17) so he learned to climb blind. These guys used the headset/walkie talkie method. 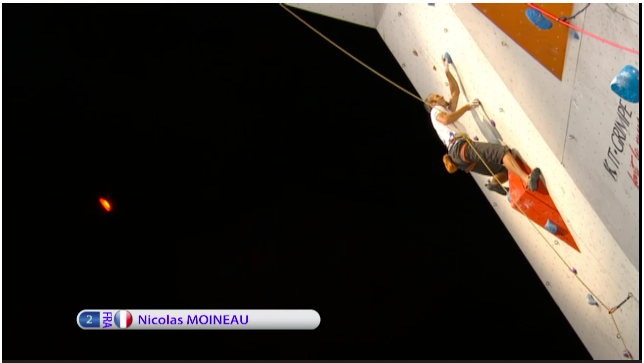 Nicolas set a new high point, and he made it all the way to the roof before falling. He scored 23+. 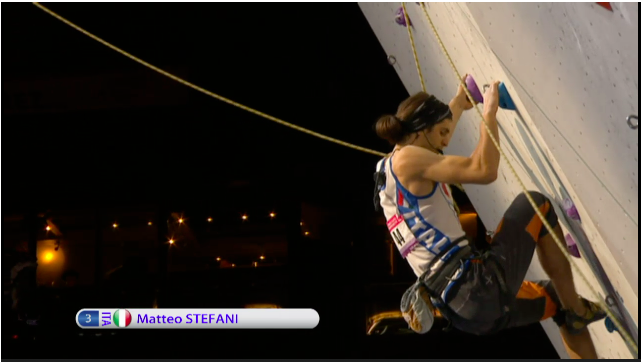 Finally the 1st seeded Italina climber Matteo came out. You can see his headset. 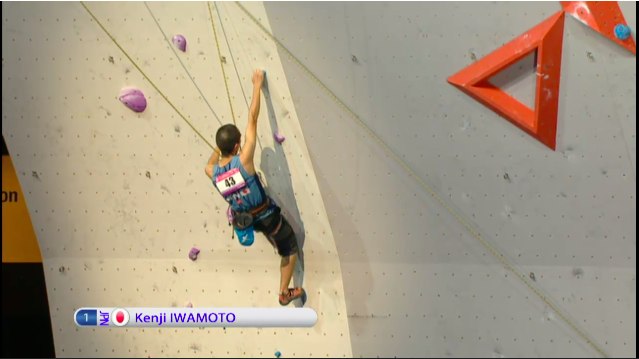 Matteo got higher than Kenji, but for some reason ended up in 3rd. He scored 10. There must have been a technical of some sort that I didn’t hear about. 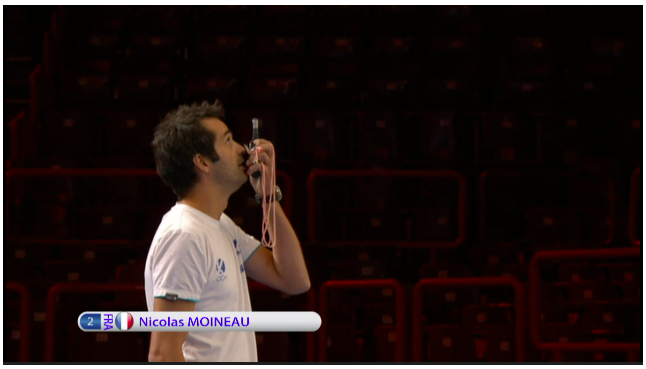 The Champion and his helper. 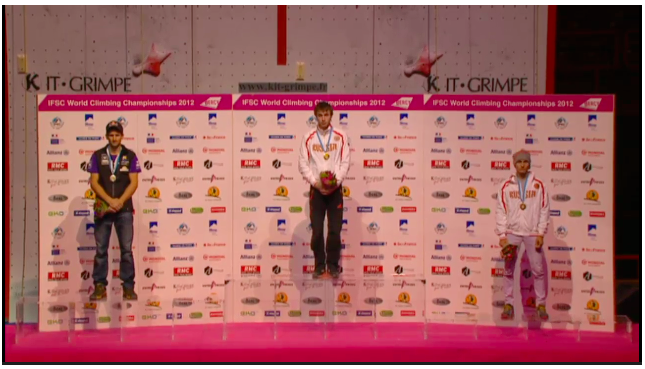 The Podium. 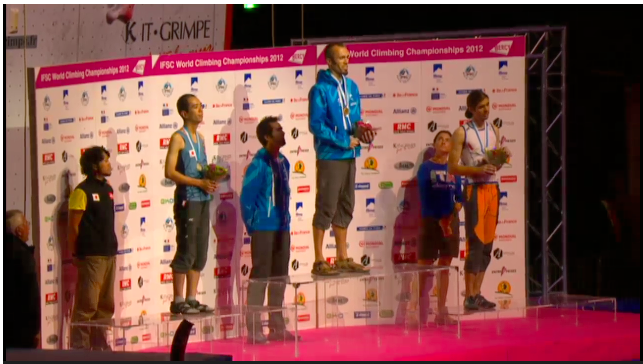 Matteo (3rd place, on the right) pretty much sobbed his way through the ceremony. 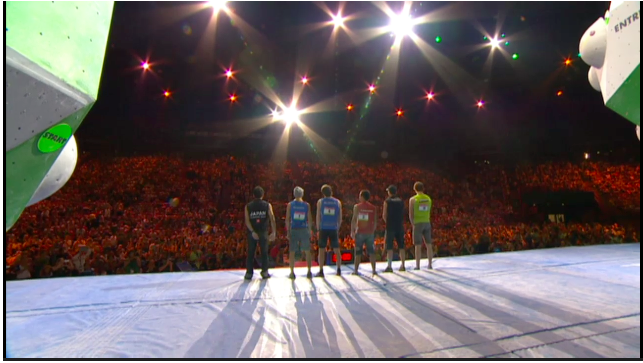 You could see it meant a lot to him to be able to be here. 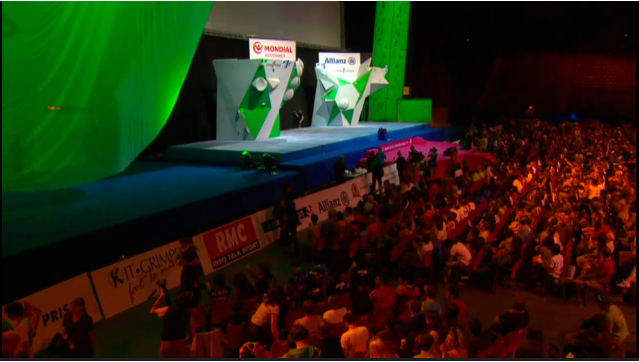 The stage, the crowd, and the walls all looked incredible at this event. 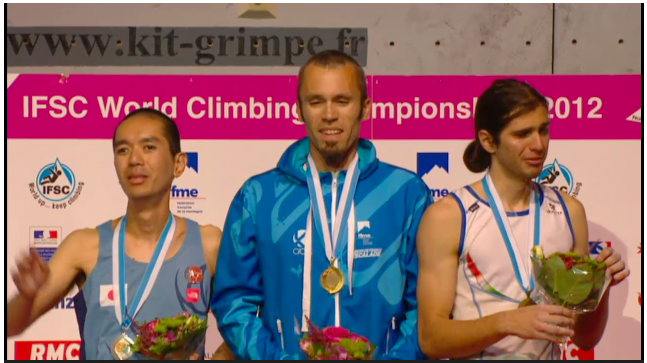 Dmitrii is World Champion, Kilian won silver, and Rustam Bronze. 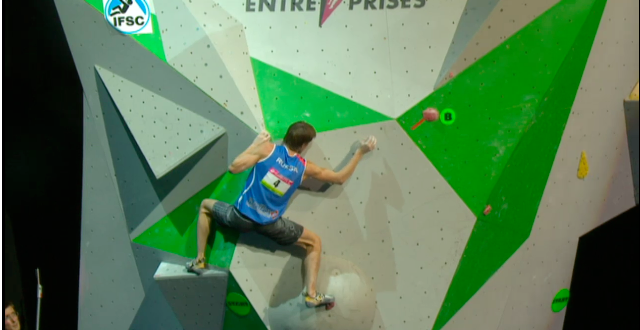 The other three finalists were Canada’s Sean McColl, Germany’s Jan Hojer, and Japan’s Rei Sugimoto. 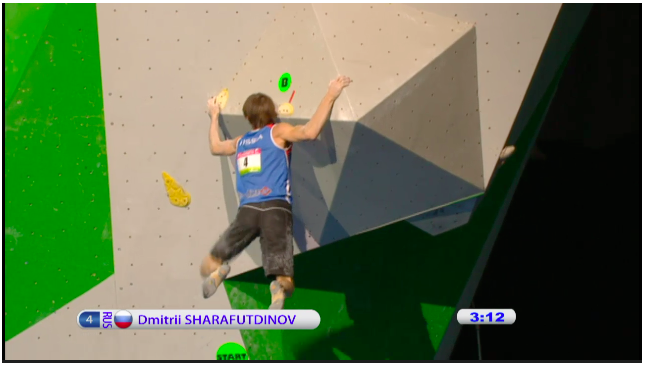 Everybody flashed but Dmitrii, who flashed to bonus, then fell 3 times before getting top on his 4th go. 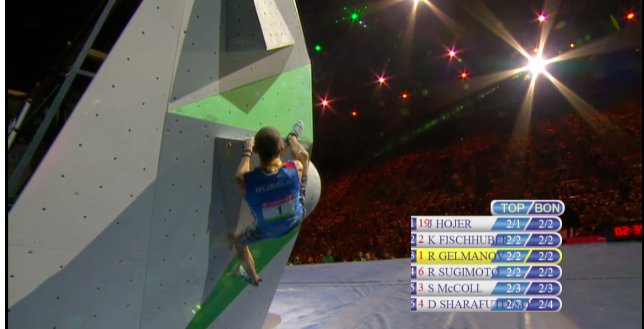 This put him in last going into problem 2. 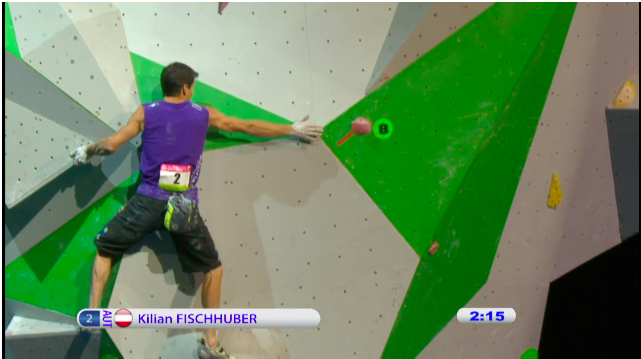 Killian flashed, putting him in the lead. 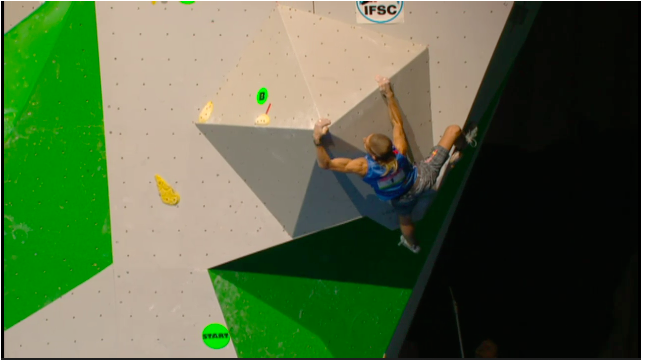 Sean got bonus and sent 2nd go, putting him in 2nd. If you get to the top without touching bonus you still get bonus points. 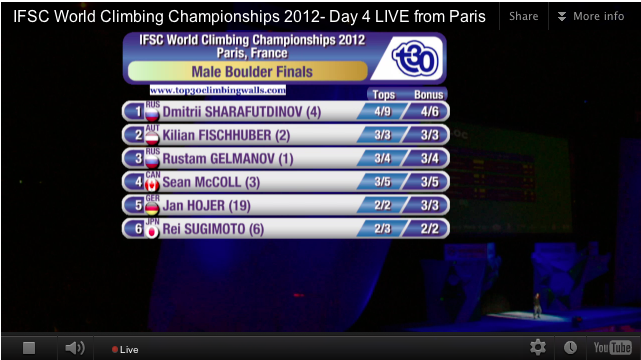 Dmitrii got bonus and finished the problem 3rd go, giving him 1 send to match everyone else’s performance on men’s 1. 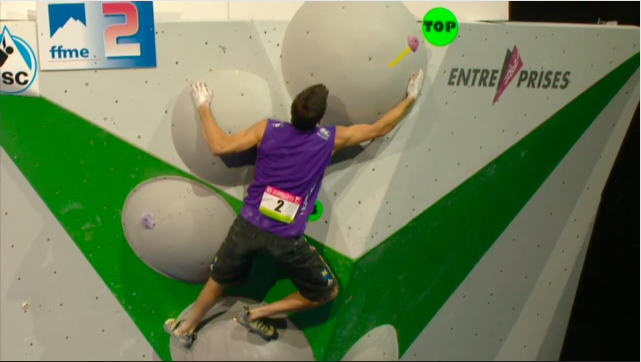 Jan flashed to bonus but didn’t finish the problem. Rei and Rustam didn’t even get bonus. 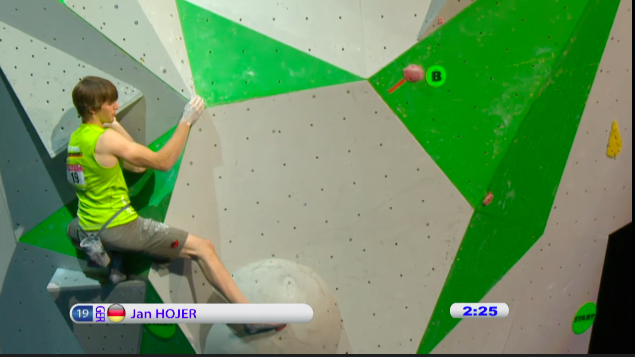 Jan Hojer on Men’s 2. Looked good, then fell apart a second later. Mantle to difficult movement out right to bonus. Dmitrii took a brave tactic and flashed. Rustam got bonus and sent 2nd go. Nobody else really got anywhere, all falling on the rightward move to the bonus hold. 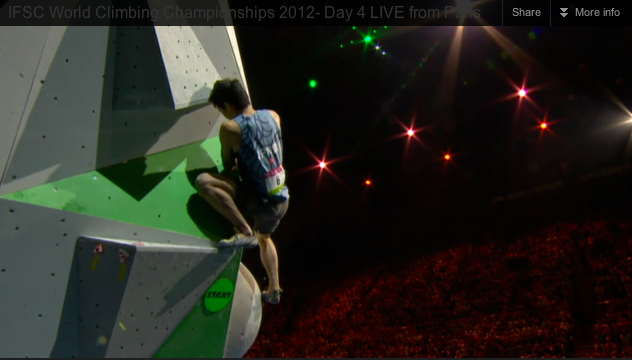 Rustam working his way around this cruxy corner on Men’s 3. 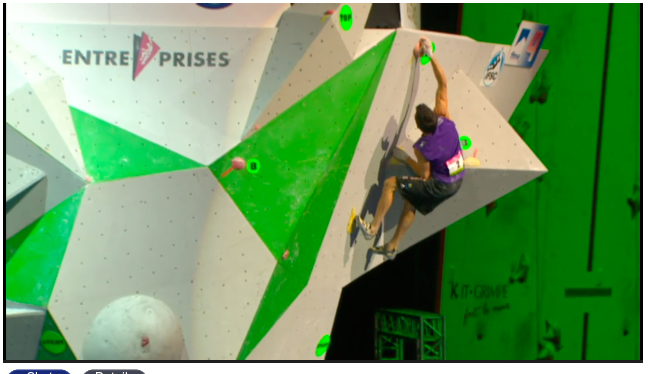 These moves really shut the climbers down. 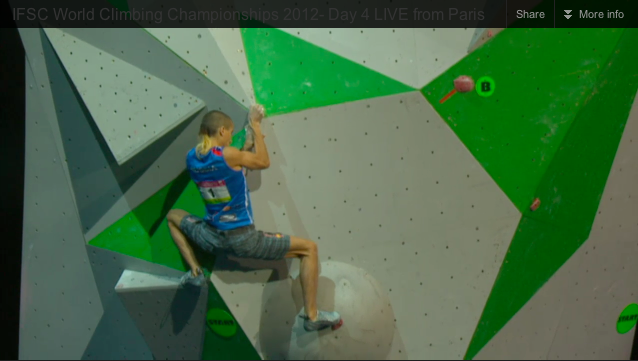 Rustam on Men’s 3. Not a great shot but LOOK AT HIS LEFT ARM! 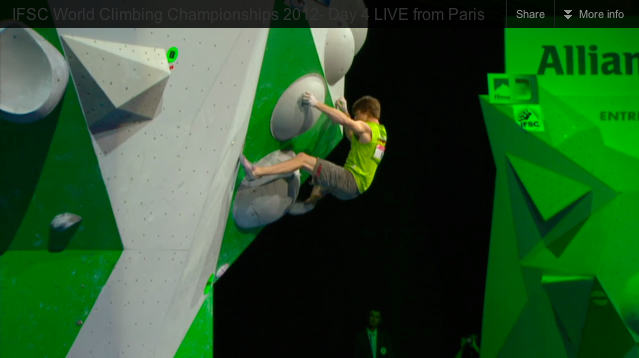 Dmitrii leaned, leaned, and then sort of deadpointed right hand to the bonus hold while flipping left. He caught himself and sent for the flash. Sean suffered here and didn’t make it to bonus. Killian took a different tactic, but it still didn’t work. Jan Hojer also suffered on this one. 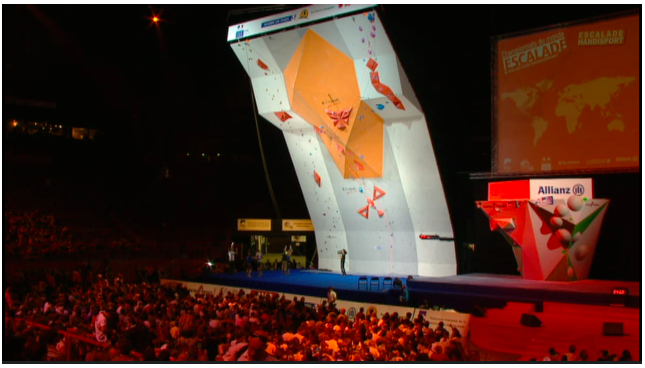 This problem was on the far right wall and was supposed to be fairly easy compared to the previous two. 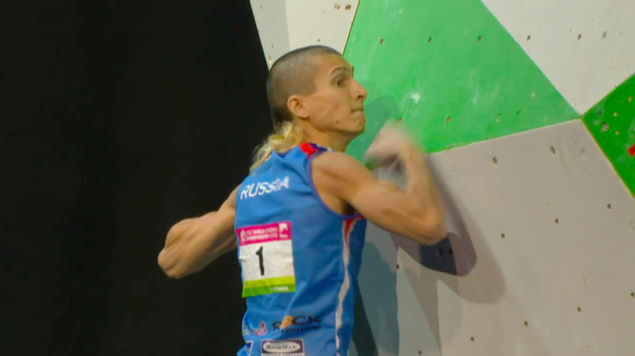 It certainly seemed to be the case as everyone sent, Dmitrii, Kilian, Rustam, and Jan flashing, Sean getting bonsus and send 2nd go, and Rei flashing to bonus but then falling and also sending 2nd go. 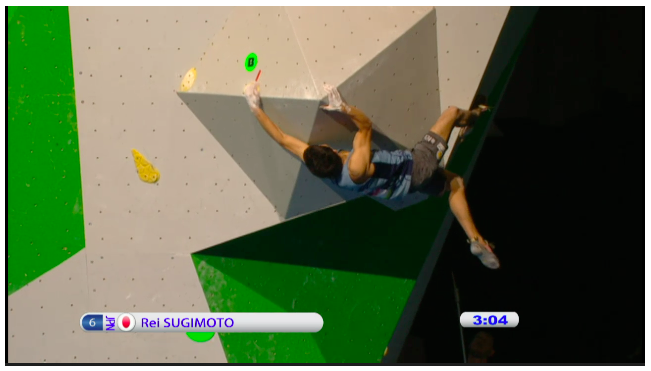 Rei flashed to bonus, then fell, then got back on and sent. 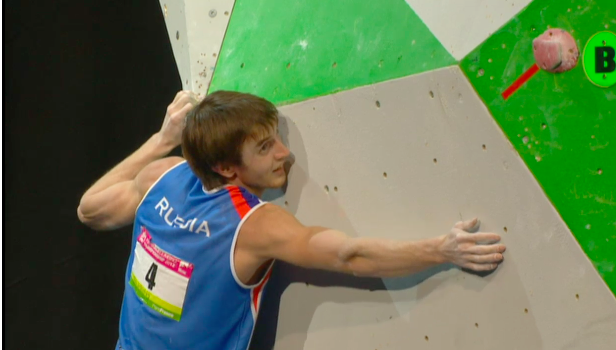 Dmitrii sticking the move out left the same way Rustam did. 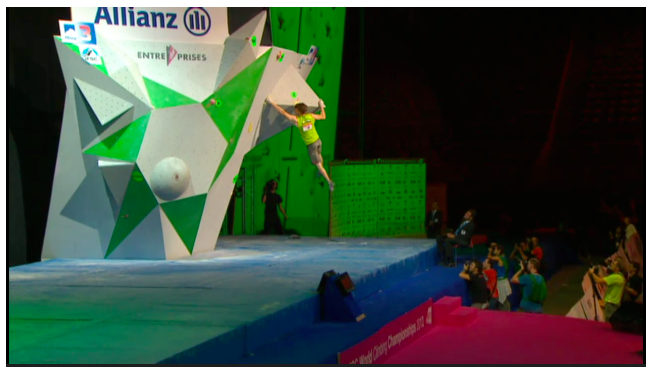 This seemed to be the hardest move on the problem. 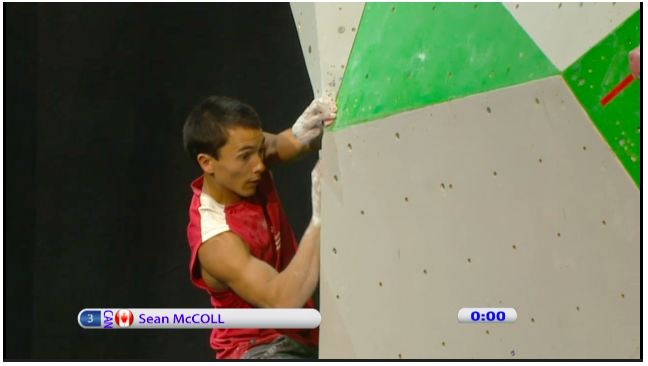 Sean McColl and wow look at the walls! Sean after sending. He knew he didn’t win but he stayed a good sport for the crowd. Which is huge. Look at that crowd! 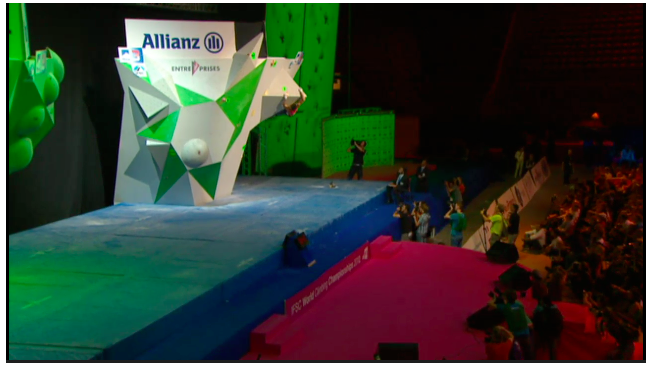 Men’s paraclimbing, Blind 1 Division finals was up next and we watched 3 blind guys climb as far as they could up a 7B+ route with an assistant shouting (or using a headset and walkie talkie) to help them find their way. More on that in the next post.